For nearly 25 years Elliot Sharp has stood for an independent music. Always when one thinks one can pin him down to a style, he is already somewhere else. Rock (in all experimental types), new music, blues, film compositions, solo concerts, drums 'n' bass, improvised music between free jazz, punk attitude and the English school-all of these genres are mastered by Sharp, the New Yorker multi-instrumentalist (main instrument: the guitar, of course, but also the bass clarinet, soprano saxophone, electronics) and composer. Sharp is, however, not only a master of eclecticism. His strengths consist in stamping his style opon this confusion. No matter if it's rock, free jazz or a composition for a string quartet, Sharp plays Sharp music in the first place: dense, dramatic, loaded with atmosphere, standing under enormous tension, and thoroughly emotional. Always precise and in the surprising moment, laconic as well. His duo with Reinhold Friedl makes these characteristics clear. 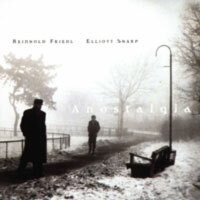 From Berlin, Reinhold Friedl is a pianist, composer and impresario. He is the musical director of the Zeitkratzer Ensemble, one of the world-wide best known ensembles of New Music, because it plays pieces by composers who have not been canonized, whose radical nature are a necessary living cell therapy for New Music, academically scabbed. Among these composers is also Elliot Sharp. Friedl and Sharp got to know each other via the work in the ensemble and decided to continue as a duo and to pave other freer paths together. As pianist, Friedl concentrated on preparations and playing inside the instrument. His defamiliarised sounds, which he knows well how to layer and densify, act like a catalyser upon the somber playing of Sharp. Thus the music sounds euphoric and fathomlessly dark at the same time, present and dense and still so far away, not of this world and still-see the cover-very Berlin-esque.